Have you ever looked at the horizon and wondered what is just beyond sight? Or driven by mountains and wondered what is beyond the peak? Or what would have happened if you would have tried to go after a dream? This past weekend, I went to Huaraz, Peru for a second time in two years. This place is magical with a valley surrounded by lush greenery, and just beyond it, snow capped mountains that touch the sky. The scenery is picturesque and I wonder if it is just a backdrop like the ones from The Wizard of Oz. 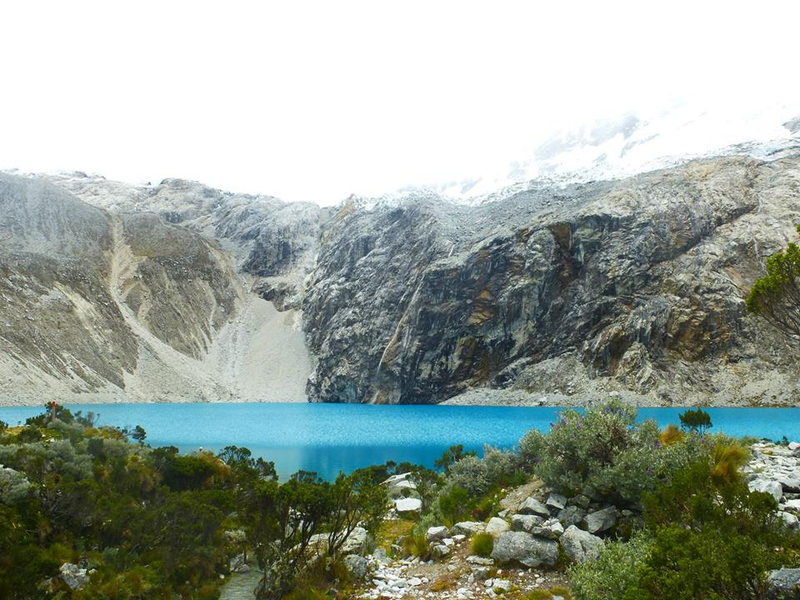 We challenged ourselves with a hike to Laguna 69 in the Huascaran National Park which is over 14,000 feet. The bus dropped us off three hours north of where we were staying in a valley surrounded by snow covered mountains, rivers overflowing from the rain, too many waterfalls to count, and pre-incan structures as we walked. We walked, and walked, and walked. Up the mountains we went. Through the rivers we forged. And each moment was a test of physical fitness, but even more so of emotional capacity. My eyes were locked to the ground as I focused on my feet so I wouldn’t trip over rocks or roll my ankles. And when I thought of it, I looked up and enjoyed the amazing scenery around me. However, as the hours went on, I began to doubt myself. I wanted to turn around and to quit. I couldn’t breathe, sweat dripped down my face and as the cold wind blew I began to shiver. Being over 14,000 feet, the oxygen was minimal and I became lightheaded every few steps. Each minute was a rollercoaster of confidence and self-doubt. As we made it up over the ridge after two hours of very strenuous hiking, I had expected to see the aqua blue lake waiting on the other side. However, instead, I saw a tiny black lake and another pasture to walk through. And just beyond that, I saw small dots of color climbing up a second ridge. They looked like small ants that seemed miles and miles away. In that moment, my head dropped and all I could do was sit down. As I sat there, I looked around me. I looked how far I had come, but how far I still had to go. In that moment, I saw progress I made in my life, and yet, how far I must go. I saw all the obstacles I overcame and all the challenges I had risen above. However, I saw all the adversity ahead of me and all of the lessons I will learn about myself and who I am. I had a choice. I could take the comfortable option and stay put and wait for the others to return in a few hours. I knew I would be perfectly content sitting on that rock. Or, I could stand up, throw my backpack on and keep pushing, which is something I am more familiar with. I am not one to sit. I am not one to surrender. And by God, I am not one to give up. So, I decided to take the mountain head on for that moment and for every moment in the future. After another hour of even more challenges and even harder hiking, the trail opened up to the most beautiful sight I have ever seen. I reached the second ridge and once again, no lake. But, it was flat land. I heard voices just ahead. There was hope! I was almost there. I began to run. I clasped my backpack around my waist and stumbled over rocks as my legs were shaking from the trek. And that was when I rounded the curve, the curve that lead to the treasure. What I love about trekking is you never know what is just round the corner. 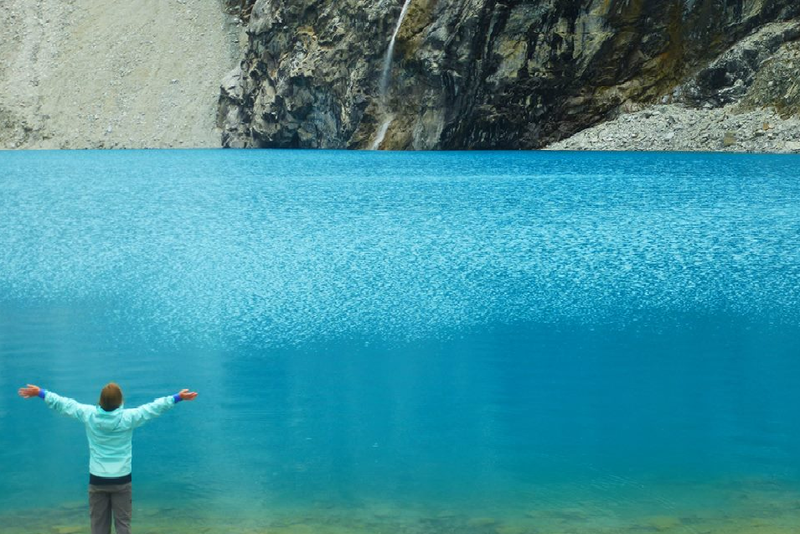 And, as I rounded the corner a bright, aqua blue lake filled my sight. The aqua lake was surrounded by white rock and snow. There was a glacier high to the right and the sun was popping out to show the real beauty of this natural phenomenon. There was a tall thin waterfall that fell from the glacier as it poured into this water calling my name. I found the treasure. So, now I am back in Huanchaco and another mountain has been put in front of me. I am sitting back on that rock staring at the second ridge and searching for the strength to keep going. However, if I do not climb that ridge, I will never see the treasure that will change my life. So, I have a choice. And I am choosing to put my fear and nervousness aside to climb that ridge and seek the treasure that has the potential to be mine. Too many times we go through life observing the beauty of the mountains, but we never take the chance to climb them. We second guess ourselves and the power we have within us. Yes, the mountain is hard. Yes, you will want to turn around. And yes, you will think you were crazy to think you could do it. But, you will make it over that ridge and you will see the treasure just beyond it, or maybe you will see a second ridge to climb. But, believe in you and the potential you have to find that treasure. One thing I know for sure, is the treasure will never come to you. You must always search for the treasure, to take the risk, and you must be the one to go for it. For it wouldn’t be treasure without the adversity, right?